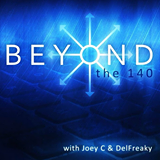 In November of 2012, I was privileged to appear on the popular podcast, “Beyond the 140 (http://www.bt140.com),” hosted by Joey C. and Del Freaky (Twitter handles @JCWisdomNuggets and @MrDelFreaky, respectively. Follow them!). They do original humor on Twitter and interview others who do so. I had a blast doing that show. In January of 2015, they rebroadcast my appearance as part of a compilation episode featuring me, along with Angie Davis (@adar79angie), and Brian Hope (@Brianhopecomedy), two of the funniest people on Twitter.